PHOTO: GETTY IMAGES/STOCK A deer and her fawns. REPORTER FILE PHOTO | This view of Shelter Island from 600 miles above was taken by a satellite in 1973. An unusually high number of complaints from Mashomack Preserve hikers about itchy, irritating bites late in the summer pointed to an inordinately high level of larval ticks of all kinds, including the aggressive Lone Star ticks. Mashomack’ natural resources manager Mike Scheibel confirmed that ticks were more abundant and said workers there had also received a lot more bites. But Lone Star ticks were relatively new to the Island at the time and their bites were considered more annoying than threatening, according to Suffolk County Department of Health Services lab director Dr. Scott Campbell. Because of the late season, he said the ticks hadn’t picked up diseases, including Lyme, ehrlichiosis and babesiosis. POSTSCRIPT: In 2013, there has been an increase in tick-borne diseases and town officials are addressing the issue by trying to get more 4-posters deployed next spring as well as to enhance hunting of deer on which the ticks feed. Shelter Island Board of Education members were examining planned cuts in transportation aid from New York State in the fall of 1993, concerned whether increases in other state aid would kick in and wondering how long other aid would be sustained. Even with the planned cutbacks, Shelter Island didn’t appear poised to get a hit for the next school year, but the district treasurer at the time was expressing concerns that projected levels of state aid wouldn’t be realized and the district could be looking at difficult times if the transportation aid cuts were sustained. POSTSCRIPT: The problems faced 20 years ago have been magnified many times by increasing mandates from both the federal and state governments that are either underfunded or totally unfunded. Among the hot political races 30 years ago was the battle between two experienced highway chiefs — incumbent Frank Klenawicus and former highway chief Leo Urban. Mr. Klenawicus was running for a third term and was endorsed by the Democrats and Independence Party. Mr. Urban had the backing of the Republican Party. He had held the job from 1973 to 1979. Although Mr. Urban defeated Mr. Klenawicus in the primary battle for Republican backing, in November it was Mr. Klenawicus who prevailed by a vote of 752 to 606. POSTSCRIPT : This year, the Highway Superintendent Jay Card Jr. created a stir a few months ago when he said he might not seek re-election. He is running unopposed. 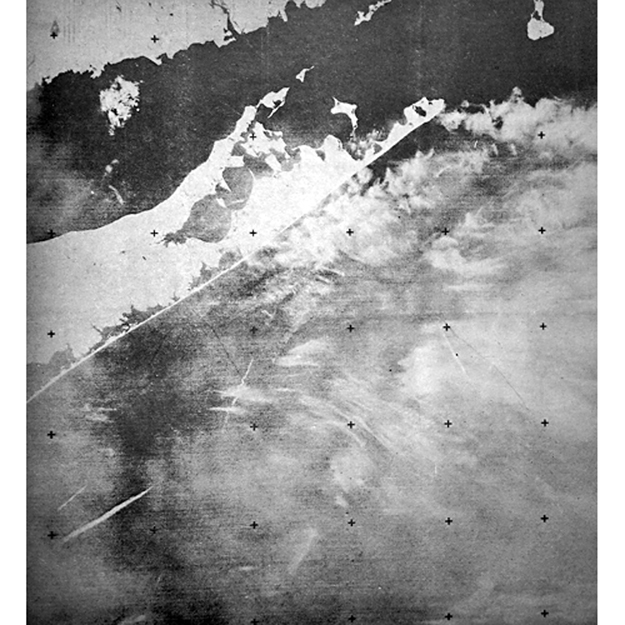 In 1973, the ERTS-1 satellite offered up a picture of the East End of Long Island with Shelter Island front and center. The picture included parts of the Connecticut shore and a vast area of the Atlantic Ocean. The satellite circled the earth every 103 minutes and was among the early efforts at satellite communication. The satelite program was operated by the Department of the Interior and was designed to gather information on the earth’s surface to develop applications of real and practical value about farming and forestry. POSTSCRIPT: Looking back, the image captured 40 years ago is nothing like those from Google earth. Islanders who haven’t been treated to Councilman Peter Reich’s scoping of locations of docks and moorings might be astounded at today’s clarity. CENTERS FOR DISEASE CONTROL PHOTO | Lone Star ticks in different stages of development, with recently hatched larva at right. Anecdotal evidence suggests there may be a surge in the population of lone star tick larvae in the region, including Shelter Island. People who walk through a cluster of these freshly hatched ticks won’t know it until they start to itch and find red welts all over themselves — and perhaps in the center of a few of those welts they’ll notice a dot so tiny it’s smaller than a period on this page. The good news is that the itching and the red welts are an allergic reaction to the tick’s saliva, not a symptom of some mysterious and terrible systemic infection. The welts and itching will go away but long after your ticks are gone; sometimes it takes a couple of weeks. Meanwhile, an anti-itch cream helps. Even better news, larval lone star ticks are not known to carry any tick-borne diseases. Lately, stories have been circulating of people finding welts all over themselves. Often they never notice any tiny ticks, all of which may have dropped off by the time the welts appear. These folks may be told by doctors or pharmacists that they’ve been bitten by chiggers. We don’t have chiggers here, according to Scott Campbell, a Shelter Island resident and entomologist who heads the Suffolk County Department of Health Services Arthropod Borne Disease Laboratory. Since he went to work for the county in 1995, he says he’s never found a chigger anywhere on Long Island and he’s been looking. Chiggers are found to the south and west, in warmer climates, he says. Lone star larvae begin to hatch in July and are active through late summer and into October. Chiggers are active earlier in the spring and into the summer, especially after wet weather. They lay scattered eggs, 15 to 50 a day in the soil. Adult lone star females lay hundreds of eggs in clusters. “That’s why people are coming in with dozens of bites,” Dr. Campbell said. What to do? Besides the anti-itch cream, put all affected clothing and bedding in a hot dryer for 15 or 20 minutes to kill any live ticks. The ticks on your body will all fall off after feeding. Those that fall off in your house will die from dessication so they are not a health threat. Dr. Campbell said using permethrin cream is not necessary although it is one of the protocols described on some web sites for lone star infestations. Take preventative measures, including treating clothing with a permethrin-based pesticide and using repellents on your skin. Lone stars can survive in drier, hotter environments than other ticks so it may be harder to avoid the places they might be. Keeping clear of heavy brush and leaves and long grass works pretty well for dog ticks and deer ticks but it seems to be no guarantee the lone stars won’t find you. It may not make it any easier to know you’ve been bitten by lone star larvae and not chiggers. But it is good to know, isn’t it, all that itching doesn’t mean you’re still infested with bugs, whether ticks or chiggers or any other little horrors? This editorial appeared in the September 6, 2012 Shelter Island Reporter.